Please feel free to download and share all of the materials you find on this page! If you have questions, please reach out to us here. We’d love to hear from you! If you have not received a presentation from The Basics but would like to know more about it, please click here to request a presentation. This poster gives a general overview of what The Basics are and why they matter. It serves well hanging in a waiting room or front desk area. This bookmark-sized card has each of The Basics on the front and activities that caregivers can do with their child on the back. Once a parent, caregiver, or professional is familiar with The Basics, it’s time to take action. That’s what the ABC Plan is for! Not only will it encourage them to take an action, it also lays out the benefits and challenges of that action. 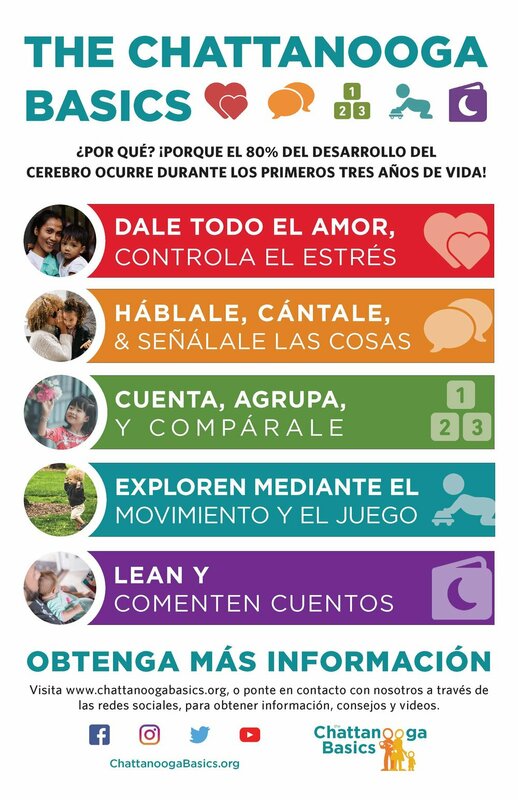 This one-page document gives a brief overview of The Basics, some of the research behind them, the role that a caregiver has with The Basics, and what they can do to help support a child’s development. This 5-page document is an easy way to show parents and caregivers what all they can do to use each of The Basics in their everyday lives. It has activities/tips for both infants and toddlers.